With expressive synthesis and bright colors Corvi shows the Baptist being dragged away by an armed man. The work of 1756 and the sketch are different from the other two kept in the Museo del Colle del Duomo for they are of smaller size and are on canvas instead of paper. From an aesthetic point of view there is little difference, according to Italo Faldi. Unlike the other two, this one does not have a frame. Domenico Corvi, Viterbese painter who in the 18th century held the first place in Roman figurative culture. 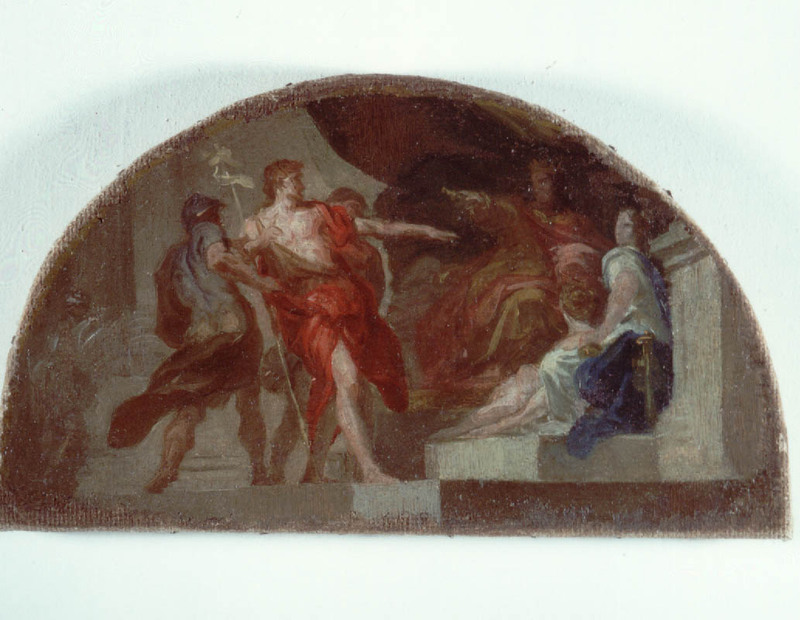 In 1756 the artist was called to fresco, along with his colleages V. Strigelli and A. Falaschi, the Gonfalone oratory which remains one of the most important testimonies of his pictorial activity. In the same year he entered the Accademia of San Luca where he worked under Francesco Mancini. The apprenticeship with one of the top Roman artists was not an easy professional beginning. He began in Rome in 1758 with a series of canvases commissioned by Cardinale Domenico Amedeo Orsini and with an altar piece showing San Michele Archangel for the Trinità dei Monti church. – N. ANGELI, Chiesa del Gonfalone di Viterbo. Storia e arte, vol.I°, Viterbo 1973. – I. FALDI, I Pittori Viterbesi, Roma 1970, pp. 74, 76-78, 344, 346, 354-355.S. – RUDOLPH, Primato di Domenico Corvi nella Roma del secondo settecento, in “Labyrinthos”, I, 1-2, 1982, pp. 9-10. – A.SCRIATTOLI,Viterbo nei suoi monumenti, Viterbo 1988,pp. 185, 186, 203, 204, 414. – G. TIZIANI, Tre bozzetti del Corvi, nel catalogo della mostra “Domenico Corvi”, a cura di V. CURVI- A. LO BIANCO, Roma 1998, p. 90. – G. TIZIANI, La fortuna di Domenico Corvi. Alcuni inediti, in “Informazioni”, 6, 1989, pp. 67-78. – Contratto redatto il 22 aprile del 1756 per l’esecuzione degli affreschi nella chiesa del Gonfalone a Viterbo. – Archivio Diocesano di Viterbo, Visite pastorali del cardinale Gaetano Bedini, vol.1-III,Viterbo 1865, foglio 80 retro.